The Global Volcanism Program has no activity reports for Fayal. The Global Volcanism Program has no Weekly Reports available for Fayal. The Global Volcanism Program has no Bulletin Reports available for Fayal. 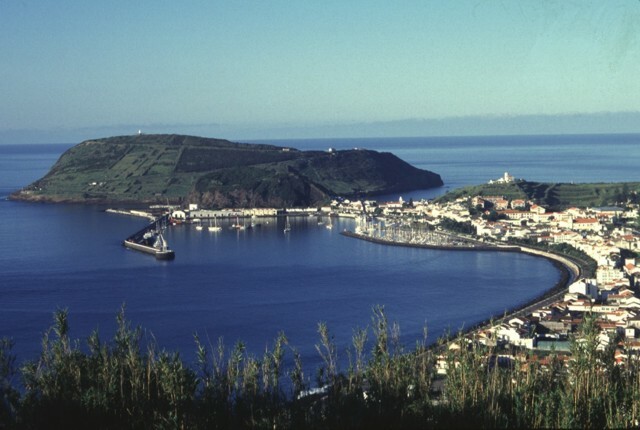 The island of Fayal, also spelled Faial, is the nearest of the central Azorean islands to the Mid-Atlantic Ridge. 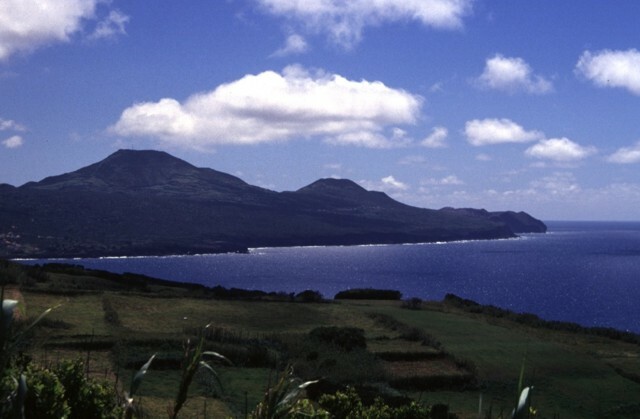 The island is composed of a complex large andesitic-to-trachytic stratovolcano that contains a 2-km-wide summit caldera. Thick deposits of trachytic airfall pumice, pyroclastic flows, and lahars related to formation of the caldera blanket the island. Formation of the steep-walled 500-m-deep caldera was followed by construction of fissure-fed basaltic lava fields and small volcanoes that form a peninsula extending to the west. This area is covered by the youngest volcanic products on the island and has been the source of all historical eruptions. 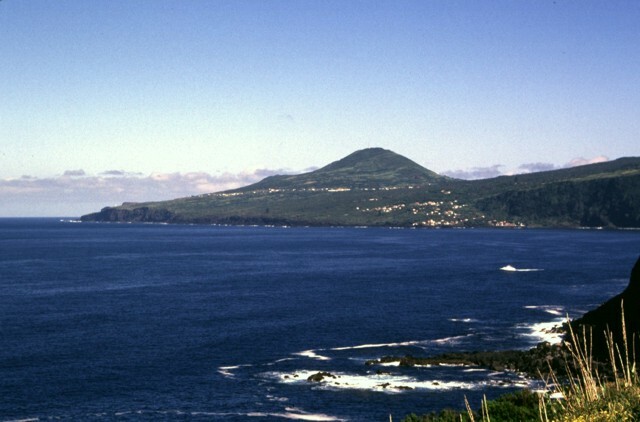 A dramatic submarine eruption at Capelinhos during 1957-58, the best-studied of historical eruptions in the Azores, created a new island that soon merged with the western peninsula. Cole P D, Guest J E, Duncan A M, Pacheco J-M, 2001. Capelinhos 1957-1958, Faial, Azores: deposits formed by an emergent surtseyan eruption. Bull Volcanol, 63: 204-220. Machado F, 1982. Excursion guide for field trip V3, Islands of Fayal and Pico. Proc Internatl Symp Activity Oceanic Volc, Archipelago Univ Azores, 3: 343-349. Waters A C, Fisher R V, 1971. Base surges and their deposits: Capelinhos and Taal volcanoes. J. Geophys. Res, 76: 5596-5614. Zbyszewski G, Moitinho de Almeida F, Veiga Ferreira O da, Torre de Assuncao C, 1959. Geologic map of Faial (Azores). Servicos Geologicos Portugal, 1:25,000 scale map with 25 p text (in Portuguese). Observed differential co-seismic interferograms. One colour fringe represents 28.3 mm of range change. Panels (a) through ( f ): track 52, frame 2835; (a): 920609?980925; (b): 930316?980925; (c): 951109?980925; (d ): 951110?980925; (e): 951214?980925, ( f ): 951215?980925. Panels (g) and (h): track 281, frame 2835; (g): 951230?981011, (h): 951231? 981011. From: Catita et al. 2005. Reference List: Catita et al. 2005. Catita, C., Feigl, K. L., Catalão, J., Miranda, J. M., & Victor, L. M., 2005. InSAR time series analysis of the 9 July 1998 Azores earthquake. 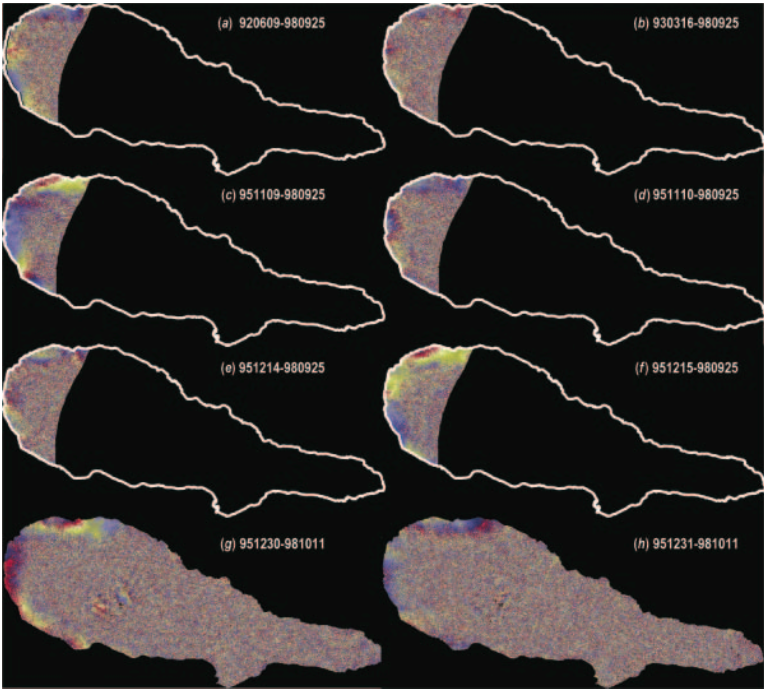 International Journal of Remote Sensing, 26(13), 2715-2729. There is no Emissions History data available for Fayal. A column of ash and steam towers above a new submarine vent off the western coast of Fayal Island in early October 1957. The vertical white bar (upper right) provides a 500 m scale. Horizontally traveling base surges form a ring at the base of the eruption column. Explosive eruptions began on September 27, and formed a small island that eventually was joined to the main island, partially burying the Capelinhos lighthouse, which is visible on the center shoreline. Lava effusion was continuous for the last five months of the 13-month-long eruption. Photo by U.S. Air Force, 1957 (published in Green and Short, 1971). Fayal volcano is capped by a 2-km-wide, 500-m-deep summit caldera, seen from its southern rim. A small pyroclastic cone was constructed on the floor of the caldera. Thick airfall-pumice and pyroclastic-flow deposits related to formation of the caldera blanket the island. This event was followed by construction of fissure-fed lava fields and small volcanoes that formed a peninsula extending to the west. A dramatic submarine eruption at Capelinhos during 1957-58 created a new island that soon merged with the western peninsula. The gentle slope along the right-hand horizon is covered by lava flows formed during the 17th century, at the time of the first historical eruption of Fayal volcano. Lava flows during the 1672-73 eruption reached the sea on both the southern and northern coasts. This eruption occurred along a WNW-ESE-trending ridge forming a wedge-shaped peninsula at the western tip of the island. 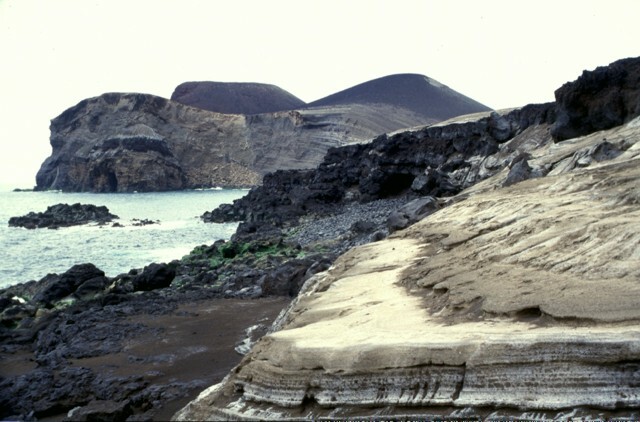 Cabeço Verde (center), seen here from the SE, is one of a chain of pyroclastic cones that were constructed along the axis of the peninsula. The eroded pyroclastic cone at the left, now forming the western tip of Fayal Island, was constructed during the 1957-58 Capelinhos eruption. 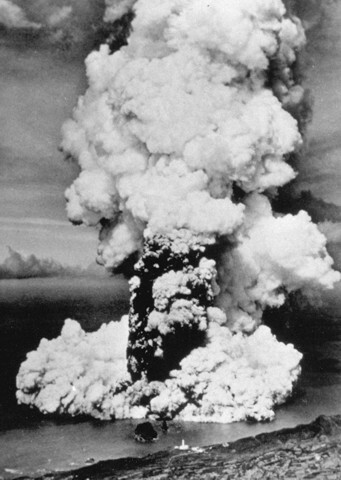 Initially submarine eruptions formed an island that was later joined to the mainland. By the end of the eruption, a 1-km-wide peninsula had been added to Fayal. Vigorous erosion by the sea soon truncated the sides of the new cone, forming the steep south-facing cliffs seen here. Beach erosion in the foreground exposes light-colored ashfall deposits from the 1957-58 eruption. Lava flows from vents along the crest of a linear chain of volcanoes, seen here from the NE, reached the sea along both the northern and southern coasts of Fayal Island during a 17th-century eruption. The 1672-73 lava flows reached the northern coast at the headlands immediately left and right of the center of the photo. 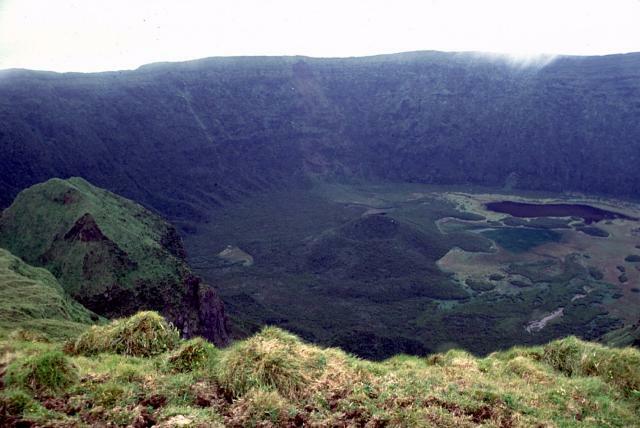 Cabeço Verde (left center) and Cabeço do Canto (center) are two pyroclastic cones along a linear chain of volcanoes that form a wedge-shaped peninsula on the western tip of Fayal Island. The Monte de Guia tuff cone forms a backdrop to the harbor of Jorta (Horta), the largest town on the island of Fayal. The cone was formed by phreatomagmatic eruptions just off the SE tip of the island, and is now connected to Fayal by a low narrow peninsula. Monte de Guia is one of a cluster of cones constructed on the lower SE flank of Fayal. These cones lie at the far eastern end of a fissure system that extends from off the western coast across the flanks of the large Fayal stratovolcano. 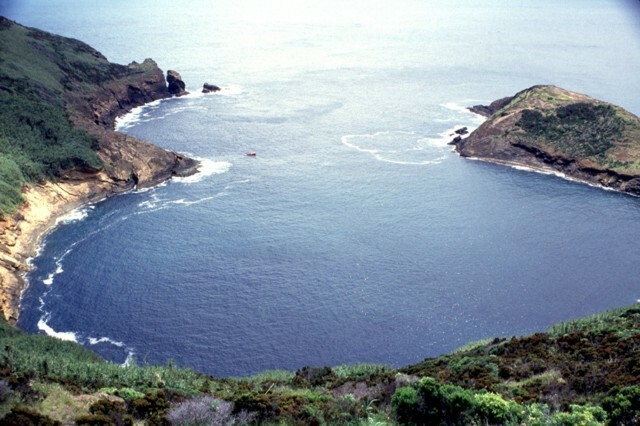 The crater of Monte de Guia tuff cone at the SE tip of Fayal Island has been breached by the sea, forming a circular bay. This view looks out to sea from the NW rim of the tuff cone, which was formed by phreatomagmatic eruptions produced when magma encountered sea water along the coast of the island. A small boat used by divers provides scale off the headland at left center. 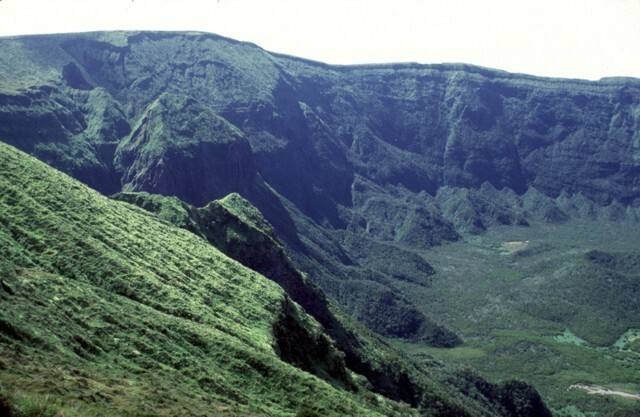 The vegetation-mantled NW wall of the 2-km-wide summit caldera of Fayal volcano rises 500-m above the caldera floor. A small pyroclastic cone constructed on the caldera floor is visible at the lower right. The outer flanks of the caldera are steepest on the NW and SW sides, which flank a wedge-shaped western peninsula that has been the site of all historical eruptions on Fayal. Pyroclastic-surge deposits from the 1957 Capelinhos eruption lap up against a lighthouse near the western coast of Fayal Island in the Azores. 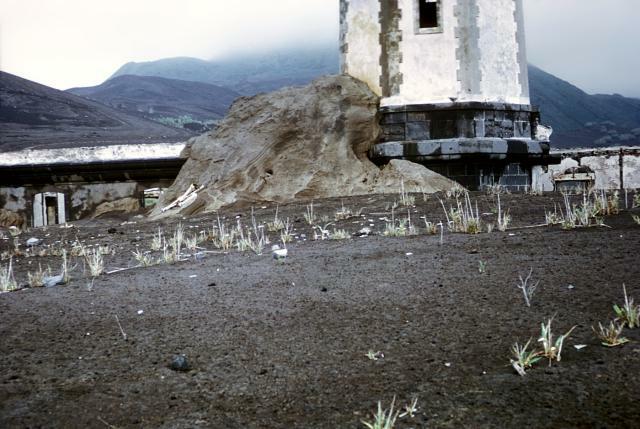 Pyroclastic surges produced by magma-water interaction during the submarine eruption nearly buried the lower floor of the lighthouse building. The initially submarine eruption began off the western tip of Fayal, forming a small island that eventually was joined to the main island. Photo by R. V. Fisher, 1979 (University of California Santa Barbara). The Global Volcanism Program has no maps available for Fayal. IRIS seismic stations/networks Incorporated Research Institutions for Seismology (IRIS) Data Services map showing the location of seismic stations from all available networks (permanent or temporary) within a radius of 0.18° (about 20 km at mid-latitudes) from the given location of Fayal. Users can customize a variety of filters and options in the left panel. Note that if there are no stations are known the map will default to show the entire world with a "No data matched request" error notice. Large Eruptions of Fayal Information about large Quaternary eruptions (VEI >= 4) is cataloged in the Large Magnitude Explosive Volcanic Eruptions (LaMEVE) database of the Volcano Global Risk Identification and Analysis Project (VOGRIPA).